Like Merchant Ships: Weekends, we love you. We curled up under a freshly washed blanket my mom bought at a neighborhood sale. I studied old Country Livings from a free box, while the kids delighted in extra books from a friend. The husband declared dinner the best meatloaf ever. A good day, all around. I'm glad your man liked it so well... since you made 6 of them! Yay! Hooray for weekends, indeed! That sounds perfect to me! Sounds like a good weekend to me too. Sounds alot like my weekend. 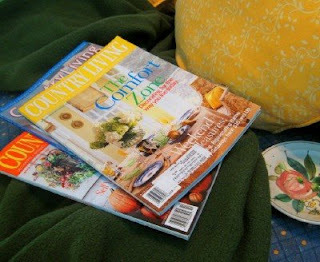 I went into the room all alone, enjoyed some quite time with a few magazines and my dog Beulah Mae on my lap and a glass of ice tea beside me. Quite, blessed quiet. oooh, now you have to share the meatloaf recipe! Okay, now will you share the meatloaf recipe! I'm so glad you had a restful day. Especially after that cooing marathon! Oh, I'm so jealous of your weekend. I'm just longing for a quiet weekend- our LLL had a yard sale and then we had many errands to run! I'm glad you enjoyed yours. :) I did spend some time on my back porch with a book though. Sounds like heaven on earth! How relaxing! This looks a lot like the Sunday afternoon here. For some odd reason, my 18 month old son keeps making me read him my Coastal Living magazines while curled up with a blanket and sippy of milk.